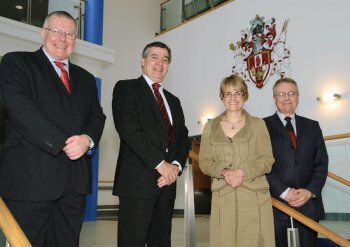 Professor Greg Lloyd, Vice Chancellor Professor Richard Barnett, Minister for Social Development Margaret Ritchie, and Professor Paddy Gray. Social Development Minister Margaret Ritchie today addressed the challenges and opportunities facing local housing associations at a conference hosted by the University of Ulster. Housing professionals and elected representatives from across Northern Ireland e gathered at the Jordanstown campus to debate how the social housing sector can move forward in the face of public spending cuts. Minister Ritchie told delegates about the need for housing associations to achieve greater levels of efficiency and new innovative ways of working. She said: “When I launched the New Housing Agenda I said we would be more creative in our approach to meeting housing need. Last year we managed to work something of an economic miracle by delivering the largest number of new social homes for more than a decade. Opening the conference, University of Ulster Vice Chancellor, Richard Barnett said: “Today’s event provides a timely opportunity for housing professionals to debate the future contribution that the housing association sector will play in creating vibrant and sustainable communities. “It also acknowledges the many challenges going forward, not least the anticipated reductions in public sector expenditure. In light of such a tough financial environment, I’m confident that housing associations will respond to continuous improvement and efficiency, and collaborative working in order to benefit from economies of scale. Paddy Gray, Professor of Housing also welcomed the conference saying: “This is an ideal time to hold these type of discussions given that the findings of the Commission on Housing will be published shortly and launched at the Conference of the Isles, which is being organised by the University's housing team in partnership with the Chartered Institute of Housing, later this month in Newcastle."